IMMUNE BOOST And it comes from Chiropractor's Blend! We have taken the B12 sub-lingual to a whole NEW Level!! Your Immune System Is The Most Critical Part Of Your Body! B12, B6, FOLIC ACID, BIOTIN Work Together To Deliver Maximum Health Benefits! And it comes from Chiropractor's Blend! Here's what Ann says about The B12 Ultra Fruit Lonzenges! These little things taste good & include some harder to find nutrients. They felt like they were absorbed well. will reorder. This is a top notch product... I always research the vitamins and supplements I use for myself an my family! After long hours and many weeks I came up with a list of high quality, reliable, trustworthy products, an this is one of them!!! I will continue to purchase this and some other products this company makes. They truly do what they claim... Here is to energy, good mood and good health!!!!!! 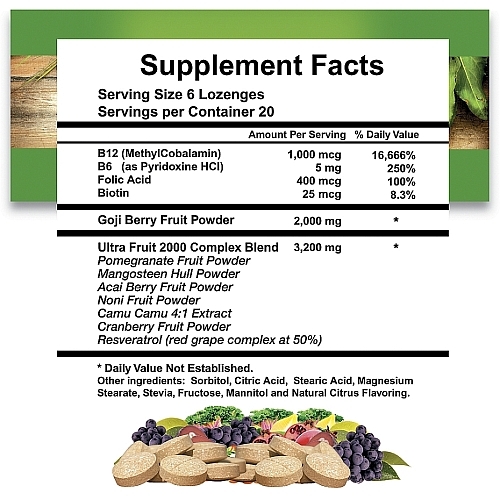 The 1000mg of B12 combine basic B vitamins with gogi and acai berry, and other super anti-oxidants. I love this B12 and will continue to purchase it! A Great Healthy Energy Boost! Did exactly what I expected and what it claimed to do. Gave me that extra energy to get me through those long days and feeling good.